A workplace gem within throwing distance of the iconic St. Pauls Cathedral. This self-contained property provides flexible workspace, event space, business lounge and meeting rooms across 14,000 sq ft of space. Each serviced office features excellent natural light and high ceilings making it a very comfortable working environment for any occupier. 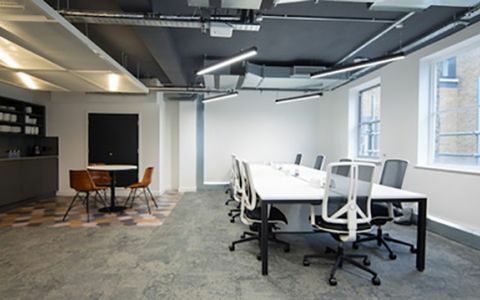 A design-led property Carter Lane is perfect for any start-up or entrepreneur needing a hub to work from or a growing business needing the flexibility to expand at any time. Uniquely, we are also able to offer self-contained floors totalling 2700 sqft to established businesses or PLC’s. We are located on the south side of Carter Lane, at its junction with Church Entry. Carter Lane itself forms part of a network of medieval streets and alleyways located between St Paul’s Cathedral and the River Thames. Carter Lane dates from 13th century when the Lane was divided into Great and Little Carter Lane. The property is located in a prime location on the western side of the City of London in close proximity to The London Stock Exchange, Ludgate Circus, Old Bailey and Blackfriars Station.